beans4fashion: Re - Use ! Blogging the past couple of months has allowed me to share my passion and my take on styles, trends, whats hot and what I love! I've found so many others bloggers who share my same passion across the country! I am one of many around the world who shares online their take an I love to see fellow bloggies and how they mix up their style. I haven't noticed many repeat offenders and lets face it, if you spend a good amount of money on a piece and you love it you should re wear it. Unless of course you are a celebrity and buying a new outfit every other day, but hey we even see celebs having repeat offenders! This top is one of those pieces, Its my favorite 7 for all man kind top. Its comfortable and thin, which is needed here in the desert. 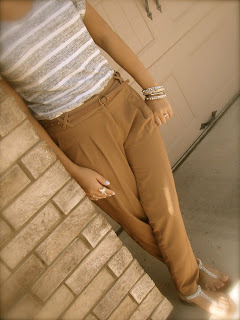 I added my favorite frugal target sandals because they tie in the gray tones of the top and forever 21 trousers!